The Central Leather Research Institute, a constituent laboratory under the Council of Scientific & Industrial Research, established 1948, is the only research institute in India dedicated to research in leather science and technology. The institute was setup to provide the much needed technological support to the leather manufacturers of India who at the time of Independence were predominantly raw hides/skins exporters or manufacturers of low quality vegetable tanned leathers. It was the visionary thoughts of leaders like Pandit Jawahar Lal Nehru, Dr Shyama Prasad Mukherjee and Dr Homi J Bhabha that CLRI came to be established as a constituent laboratory under the CSIR. 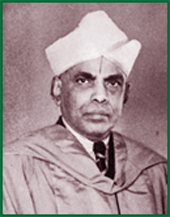 Dr AL Mudaliar, former Vice Chancellor of the University of Madras was instrumental in bringing this institute to Chennai. He offered space within the University premises and also initiated a degree program in leather technology. The Leather Technology Course at the University of Madras was unique in that it brought a rare synergy between the researchers of CLRI and the academics of the university. This partnership has today blossomed to a trinity partnership of Academy – Research – Industry. The course is now a part of the Anna University, with the scientists of CLRI serving as honorary teaching staff of the University.